The Remorse of Nero by John William Waterhouse. 1878. Oil on Canvas, 37 x 66 inches. Private collection. J. W. Waterhouse's The Remorse of Nero depicts the Roman emperor Nero sadly contemplating his dead mother, Agrippa, whom he had murdered. Agrippa had installed her son as emperor in 54 AD after killing her husband-uncle Claudius. Nero and Agrippa reportedly had incestuous relations, and after her murder he allegedly praised the corpse's beauty. Nero lived a life of infamy for more reason than one, however; he was believed to be behind the burning of Rome to clear land for his grandiose residence, the Domus Aurea (Golden Palace), flaunted his bisexuality, and systematized the persecution of Christians. Waterhouse's painting successfully captures the opulence and cruelty of Nero's reign. The sofa's mother-of-pearl inlay, the richly embroidered pillow, and the buttery strokes of yellow and beige convey lavishness. Remorse is just as evident as luxury. The Emperor's brow is wrinkled, his eyes enlarged from weeping, his head rests on his hands, and a murky shadow falls on much of his face and hand. It is evident that cruelty has taken its toll on Nero. The Remorse of Nero must be considered as part of an ongoing debate among Britons who sought to preserve their own empire by avoiding the mistakes of their predecessors, particularly the Romans. Conservative commentators of the day regularly criticized artists for presenting alluring images of Rome that downplayed the imperial Rome's moral degeneracy. Waterhouse's painting of Nero may be seen as a reaction to the false idealizing of his contemporaries. The Emperor is unattended and in an almost feminine pose. The painting does not represent a grand event but depicts Nero as an anti-hero. It is an alternative image of him as melodramatic and not victorious. The Remorse of Nero was a poignant reminder that the Roman Empire was not all glory — and neither was England's. Does the painting depend more on detail or its sole subject to convey its meaning? 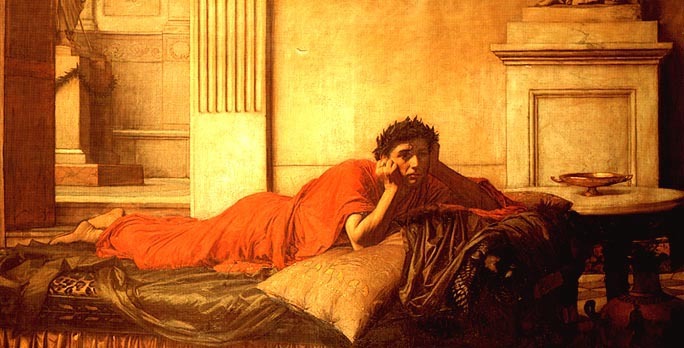 How do the colors, especially Nero's red toga, reflect meaning and irony in the painting? Why might Nero's laurel wreath — bestowed for fine musicianship — be seen as ironic? Trippi, Peter. J. W. Waterhouse. London: Phaidon, 2002.